Published By: Jacqueline Pham on July 28, 2009. 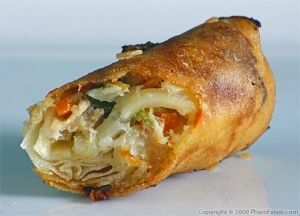 I love Vietnamese fresh spring rolls, my husband doesn't like it with shrimps, so I always make the vegetarian version. 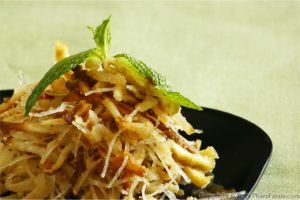 This recipe of yours is a must try recipe. Looks delish! I would check with local restaurant supply companies, they sell to you if you give them a name, like use your blog URL, and they will ship you a catalog. Also ask them if they sell dinner ware and catering supplies, and you can purchase things like that. I also use pieces of thin cut marble and wrap napkins around small boxes to tier them up for a display, and nice presentation. You can do that with platters as well, and cut glass. Hope that helps, and I am a total dish hound! So I understand that it caught your eye, me too! I love these flavors together, and the Thai basil makes it great! Wish I had Thai basil in my garden this year. I love fresh spring rolls, especially in this hot weather we are having right now in Virginia. Thanks for suggesting a brand of rice paper , I always get confused which one to get at the Asian market. Bi Chay is one of my favorite summer treats. I'll enjoy trying to make it! I love these fresh spring rolls but still find it very difficult to get them here. This recipes are helping me a lot. thanks for this wonderful information. Hi Jackie - so glad to find you, I adore Vietnamese food. And other fusions foods too, looking forward to exploring your blog. Hi and thanks for visiting my blog - yours by the way is fantastic! And those spring rolls look amazing! I love how healthy these rolls are and in Summer we have these at least once a week. Always with lots of nice, fresh mint! 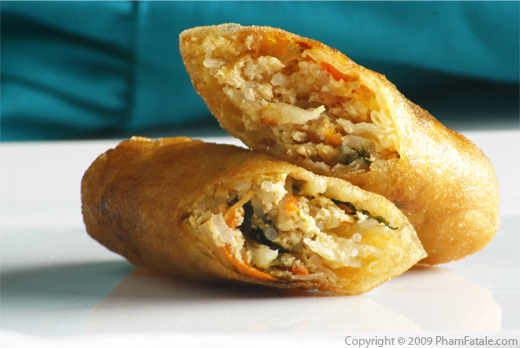 These spring rolls look so delish! as i turned a veggie i should try this one! So, Jackie, every May I make a small plate meal in which every item contains flowers. This year a friend had some amazing parrot tulips that were just maybe getting ready to drop their petals. It turns out that tulips are edible, so I made your recipe with the peanut sauce and the guests wrapped thie own rolls and suaced them. OMG-- it was everyone's favorite plate. Thanks so much!